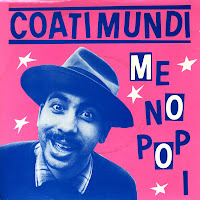 Coati Mundi is the stage name of Andy Hernandez. He was member of Kid Creole and the Coconuts, playing the vibraphone. He scored a solo hit in the UK singles chart with 'Me no pop I' in 1981. Coati Mundi appeared as an actor in the film 'Who's that girl', starring Madonna. He wrote and performed a song for the soundtrack album called: 'El Coco Loco'. I bought the single in Denmark, remembering the song after more than two decades of not hearing it. Amazingly, the hit version is on the b-side of this single.